Have you been told you have acid reflux and need to take “these pills” for the rest of your life? My daughter was diagnosed at 2, had a nisson fundlplication soon after; and still suffered for years. Every time we did an endoscopy still had red raw throat. Finally; after trying everything I had enough! A horrible rash over all her body, acid reflux and trouble sleeping. What was a mother to do? I finally talked to a friend about raw milk. We tried it, but I could not drink it as I sneezed horribly; so while it helped my daughter it didn’t help me and now I was diagnoses with acid reflux too! Then we bought an old cow that was headed to the butcher. She was a beautiful Jersey, but was 5 years old and dairies just don’t keep cows with swinging udders after that. Ellie May was so gentle and the girls loved her. Then I got the shock of my life! After going to an allergist and being told I had sever dairy allergy; I tried her milk and had zero reaction! Not the hour of sneezing I usually had, nothing; plus my acid reflux disappeared and I had no more trouble sleeping or sleeping on two pillows! Research showed that A2A2 milk often helped with these issues. I had Ellie May tested and it was true, she was our first A2A2 cow. Suzi and I both have autoimmune disease and so our diet is very strict. When she spent two months in a children’s ward, the only thing she could keep down was the raw milk from A2A2 cows. After seeing for myself what a difference it made, we began milking these A2A2 cows for others, and now several more A2A2 raw milk dairies have started up. Because of her severe health issues, I test my cows often and for everything. I have been laughed at, called a fool, and even threatened (because our standard of testing endangered other dairies into maybe having to test their cows). We have exposed dairies with contagious pathogens through our testing. We have learned a LOT. Remember that only a few years ago she was here, and she is the reason you get your milk safe and cold and local! This is a cheese bread recipe from Georgia. Every winter a heat the house with my wood cookstove. This is the time of year I make most of my cheeses. I do not make a lot of bread but Betsy has inspired me to try some this year. 1. In the bowl of a stand mixer combine the salt, yeast, sugar, and flour. 2. Heat water and milk to about 115 degrees Fahrenheit. Then pour it into the bowl of dry ingredients. 3. Begin kneading the dough with the hook attachment until it’s close to being smooth and elastic. 4. Add the oil into the dough and knead for another minute. 5. Drizzle a little bit of olive oil onto the bottom and sides of a deep bowl. Place the dough inside the bowl and cover with plastic wrap. Set the bowl in a warm place until the dough doubles in size, about 1 hour. 6. 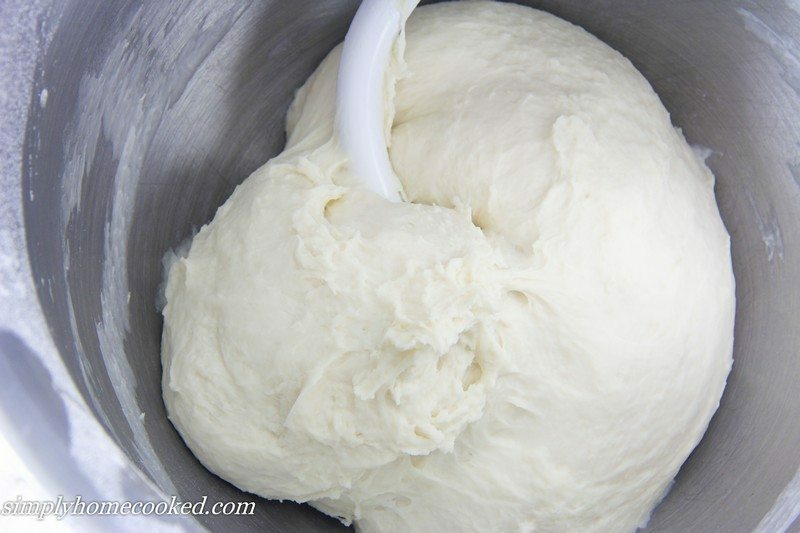 Remove the plastic wrap and press into the dough a few times with your hands. Cover with plastic wrap once more and let it sit in a warm place for another 30 minutes. 7. Meanwhile, combine the farmers cheese, feta, and mozzarella in a bowl. 8. Remove the dough from the bowl and place it onto a floured surface. Then cut it into 4 equal pieces. 9. Spread each piece of the dough into a circle about 9 inches in diameter. Then roll 2 opposite sides of the circle towards the center so it ends up have a boat like shape. Then pinch the corners together. 10. 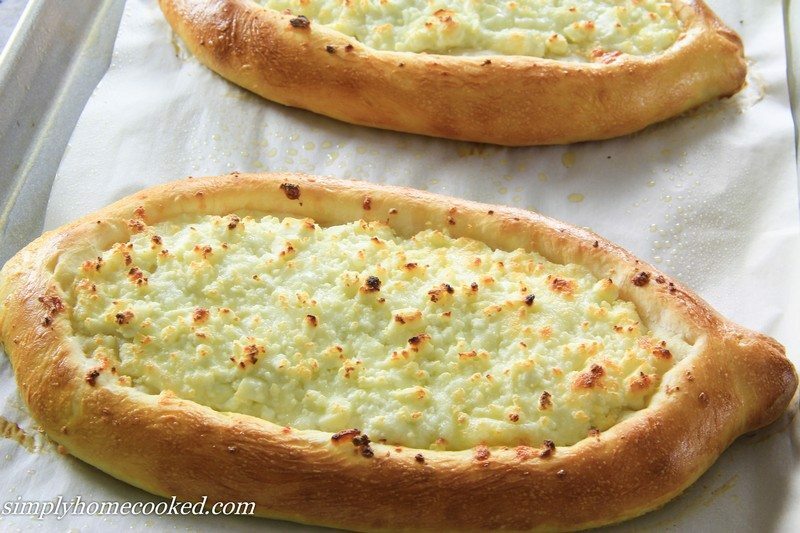 Transfer the khachapuri onto a baking sheet lined with greased parchment paper. 11. Stuff each khachapuri with the cheese mixture. Beat 1 egg with a teaspoon of water, then brush the dough with egg wash.
12. Bake in a preheated 450 degrees oven for about 15 minutes or until the crust becomes golden brown. 13. 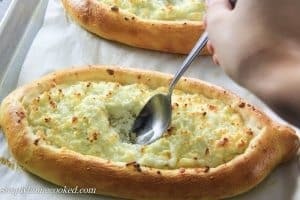 Make a well in the center of each khachapuri with the back of a spoon (about 3 inches in diameter) and drop 1 egg into each well. Then stick a few small pieces of butter into the cheese. 14. Return the khachapuri back into the oven and bake for another 5-6 minutes. Cooking time may vary depending on your oven. The egg white should be white but still pretty runny. It will cook further as it sits in the hot cheese. When serving, mix the cheese and egg with a fork and serve immediately. My friend Yatang told me about her success on hot days of getting her three boys to eat a good, quality breakfast. Her secret? Cold, fresh fruit and creamy oatmeal that they can go to the refrigerator and pull out for themselves. Place the oatmeal in the bottom of a pint wide mouth jar. Add the kefir and cream and stir. Add honey now if you want a sweeter breakfast, and stir until the oatmeal is all mixed and slightly wet. Top with your fruit and nuts if you like. Place in the refrigerator overnight and in the morning you will have a very filling breakfast. Each child can take his/her own cup and feed themselves. I made a hit for Bob by adding strawberry flavored gelatin mix to his kefir, stirred in well and then added some of my strawberry jam to the fresh strawberries. Yeah, I know. But it is quick and easy and he loved it. Over the years we have bought, sold, and raised many milk cows. We have learned a lot on this journey. Come along and find out what we learned, and tell us who was your favorite cow? all 4 are A2A2, who is your favorite? The first Jersey milk cow we bought at our Grenada ranch was one our daughter found in a poor situation in Redding. This is what Hattie Mae looked like when we first took a chance on her. Both Bob and I were vet tech’s and felt that she was not sick, just starved. She was turned out in a pasture with two big calves on her. We respect what people say about cow’s milk is for calves, but this poor cow just could not keep up with the demands without our help. Our great friends, Shawna and Jacob Barr came to the house when she looked like this and fell in love with her. She was the beginning of their very successful herdshare, Kid Creek Pastures. I felt that Bob and I had done the best we could for her, she was in a great place and I really could not handle the milk. I had a back prick test done for allergies and found out I was allergic to milk! After we sold her, others began to come to us looking for a healthy family milk cow. Being experienced buyers, we began to look and see what was available. Looking on Craigslist we found Ellie Mae an amazingly gentle cow that our two young daughter enjoyed milking. The other amazing thing I found was that I could drink her milk! It was while milking Ellie Mae that neighbors began to clamor for our milk (her milk turned out to be A2A2). Unfortunately we went back to the same seller and that was when we found a large number of cattle “brokers” who actually owned no cows, they sold right off dairies pretending to own and give fake histories. We bought a poor sickly cow, sight unseen, for neighbors and 5 heifers who proved to be freemartins. We had trusted him and took him at his word. We learned a powerful lesson. While these heifers were adorable, they were also destined to become beef. Later we found 4 nice springing heifers from a farm in WA area. Durabelle who ended up A1. Her name was Dusty, but we changed it to Galant Bess when she got off the truck. What a mess! The poor girl was 200 lbs underweight, wormy and full of ticks. Gallant Bess is still with us today; and her daughter Lola will start her milking career in a month. Bess now, shiny and beautiful. crossing the road to pasture. Lucy! A1A2, and her daughter Ethel A1A2 Who finally gave us an A2A2 heifer, LILLY Who is milking now. So, tell me, who is your favorite cow? A friend of mine posted this recipe. I tweaked it a little to make it better. The photo and recipe is from the whole food diary site. Melt together 2/3 cup coconut oil, 4T molasses or honey, 8T sunbutter, peanut butter or almond butter, or a mix of all three! In a blender, pulse 4C oats and 1 tsp salt until they’re mostly broken down but still coarse. Add 1/2 c pecans or other nut and pulse again until coarsely chopped. Add the melted mix into the oats and blend until combined then add 1/2C raisins and pulse just a few times to incorporate them. Butter a 8×13 pan. Press mix into the pan and place in the freezer to harden up – about 15-20 minutes. While they freeze, melt together 6T coconut oil, 2tsp-2 T honey/maple, pinch pink salt and 1/2c cocoa.